The knob on my GE washer won’t turn. It just spins and I cannot turn the washer on. I removed the plastic knob by pulling up and the piece on the knob that holds the washer shaft is cracked. How do i replace it? I have a pile of clothes I need to wash today. I need advice on fixing my washer ASAP. I know I probably need to buy a part but in the meantime is there a way to make the washer work just to wash my clothes right now? Replacing your washing machine knob is easy. We will tell you how to go about ordering a new knob below. To get the washer to work for now to wash your pile of clothes, get a pair of pliers and grab the shaft of the timer (the part that sticks out once the knob is off). Grab the shaft and turn the pliers in the direction you usually turn to set the timer to the appropriate washing cycle. This should make it so it is possible to wash the clothing right now. Instead of ordering a new washer knob, you may want to try and fix it yourself. To fix the broken or cracked plastic knob, use epoxy glue. Apply the epoxy to the cracked area of the knob. Hold it together tightly while it is drying with a pair of needle nose pliers. Hold the cracked plastic together for the amount of time the epoxy instructions say. Hold it together until the epoxy glue is completely dry. Next, slide the washer knob back onto the shaft. Test the knob by turning it to a wash cycle. If this has worked or not it is best to purchase a new washer knob for your washing machine as the repair you just made may not hold for long. Gorilla epoxy glue works great on bonding plastic! 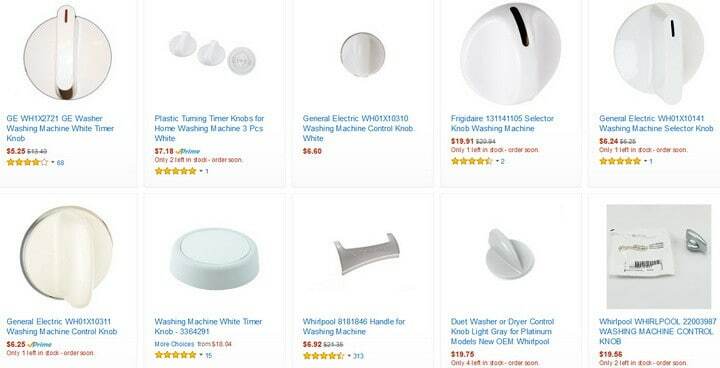 The cheapest way to buy a new washer timer knob or selector knob for your Whirlpool, GE, Kenmore, Frigidaire, Samsung, Electrolux, Hotpoint, or Maytag is through Amazon. The washer knobs available are inexpensive and most are genuine and will be the exact replacement just like the original. The prices are relatively cheap ranging from $5 to $30 dollars depending on your brand of washer. Click here to see the page where all of the washer control knob and washer selector knobs are listed and available for your washer. Replacing the washer knob should take you a few seconds. The new one you purchase will slide onto the shaft of your washer timer and should be as good as new. You can then begin using your washer immediately. 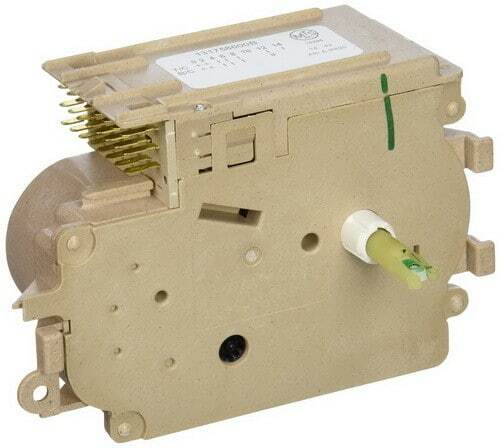 If your washer timer or washer selector switch is the issue, see below. If the washer knob is NOT cracked but the shaft on the switch or selector has broken off or will not turn, you will need to buy a new washer switch or selector. Replacing the washer timer switch or selector switch is not as easy as replacing the knob but by following the instructions it can be done by almost anyone. 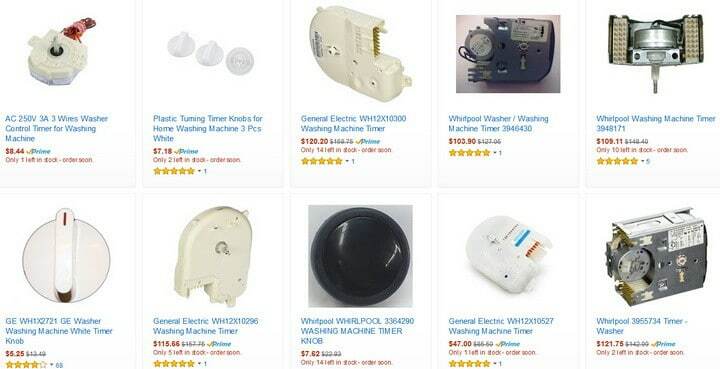 The easy way to buy a new washer switch or selector is through Amazon within the category of “Washing Machine Parts & Accessories”. Have a look here to find the washer switch/selector that will fit your model washer. Most washer switch/selectors will cost between $40 and $100 dollars depending on your brand. This may seem expensive but consider calling a repairman that will charge $100 just to show up! Doing this job yourself will save you money and get you more comfortable with doing home repairs. Remember that replacing parts on appliances can have multiple steps where not all machines are the same. Please use caution and common sense when performing these repairs yourself. We have an old Malleys (Aquarius 1500) Washing machine (i think at the time it was owned by Simpson), but neither seem to exist now. The dial has over the last year become worn, so that the knob turns without actually moving the dial. While it’s not completely worn, it’s becoming more and more difficult for my father to engage the dial so that he can turn it to the cycle needed. The timing is also a little out in that it stops just before the deep rinse cycle. I’ve looked through the dials on Amazon, but can’t find the one we need. Are these fairly simple to change? I have a top load Kenmore washing machine and the knob just keeps turning. The knob I’m talking about is the one that i turn to set the wash cycle time. Same knob that sets and starts the washer. If the knob keeps turning, does that mean the knob is broken or the timer that is attached to? Either the knob is cracked and therefore it cannot turn the timer, or the timer shaft has cracked and a new timer is needed. Remove the knob and check to see if you need to replace the knob (if cracked) or the timer for your Kenmore washer. Previous post: Samsung Refrigerator Water Filters – How Often Should I Replace My Filter?